More investors are finding the UK business location they seek outside the hubbub of London, in next generation Birmingham. What have multinationals like Jaguar Land Rover, global financial services giants like HSBC and Deutsche Bank and advanced manufacturers like HydraForce found in Birmingham that they couldn’t find elsewhere in the UK — even in greater London? Several things, but the bottom line is a highly hospitable real estate market with a dynamic business climate, a high-end talent pool and a transportation network that rivals that of any Western European business center. Birmingham rose 14 places to 6th in Emerging Trends in Real Estate® Europe 2015, the most recent property investment analysis from the Urban Land Institute and PwC. Britain’s second city beats London (10th) and Edinburgh (19th), the only other UK metros to make the top 20. In Site Selection’s World’s Most Competitive Cities Report 2015, Birmingham is the highest-performing metro in Western Europe, ranking 1st in four industry sectors (Aerospace, Food & Beverage, Machinery and Metals); 2nd in two sectors (Automotive and Transportation & Logistics); and 3rd in one (Electronics). It appears in the top three in more sectors than any other UK metro. According to UK Trade & Investment, 73 FDI projects were attracted to the Greater Birmingham and Solihull LEP (local enterprise partnership) in 2014-15, the highest of all LEPs, creating 4,739 new jobs and preserving 1,365. Birmingham is the most entrepreneurial UK city outside London with more than 18,300 new businesses registered during 2014, an increase of over 2,000 from the previous year, according to StartUp Britain. According to figures produced by the Office for National Statistics (ONS), 58,220 people aged between 30 and 39 left London between June 2012 and June 2013. It is the highest number on record and a 10 percent increase on 2010. The peak London-leaving age for men is 36 and for women it is 34. Rather than heading for the peace of the countryside, the thirtysomethings departing the capital are instead gravitating towards other UK cities. Birmingham is the most popular, with 5,480 Londoners choosing to move there in the year covered by the statistics. Birmingham is 18th in a list of the 50 most sustainable cities in the world, ahead of New York and Tokyo, according to the Arcadis Sustainable Cities Index. The quality of life of Birmingham’s residents is ranked higher than Rome, Hong Kong and Dubai. Several recent projects reveal Birmingham’s allure to capital investors in their respective industries. Chicago-based HydraForce, a manufacturer of high performance electrohydraulic controls, has moved into a new 120,000-sq.-ft., purpose-built facility in the Advanced Manufacturing Hub (AMH) at Aston Hall Road, one of six economic zones identified by the City Council to drive Birmingham’s future growth ambitions. The new facility adds an additional 75,000 sq. ft. of manufacturing capacity, providing the company with much-needed capacity to build electrohydraulic cartridge valves and other products for the European market. HydraForce’s highly skilled workforce is a key reason for the business’s resilience and growth, says Peter MacDonald, UK managing director. “Many of our staff have been with us for years, and we value their knowledge and expertise. The Advanced Manufacturing Hub was the ideal site for us because it’s logistically well placed — only three kilometers from our previous location at St. Stephen’s Street, which made it relatively easy for our staff to move with us,” adds MacDonald. Guhring, one of the world’s leading manufacturers of precision cutting tools, will become the second foreign investor to locate to the Advanced Manufacturing Hub (AMH) in Aston Hall. The $18.7-million (£12-million) investment will enable the German-owned supplier to BMW, Ford, Jaguar Land Rover, Nissan, Airbus and BAE Systems to create 50 new jobs and safeguard a further 75. Guhring will be recruiting both skilled engineers and those who want to start a career in the UK’s vibrant manufacturing industry. The AMH will provide space for the growing firm to expand its presence in the UK. Guhring’s new facility will enable it to accommodate R&D and a full manufacturing process. Guhring has taken 3.5 acres to build a 60,000-sq.-ft. facility, with further space for expansion available. Foreign direct investment is central to regions’ economic success and regional prosperity. So is connectivity, and Birmingham features both. Wouter Schuitemaker, investment director at Business Birmingham, explains: “The city’s physical infrastructure — from New Street Station’s £600 million ($940 million) redevelopment to the £130 million ($204 million) expansion of its Metro and the construction of the HS2 high speed railway [linking Birmingham to London, initially] — is driving interest from overseas. Global names such as Jaguar Land Rover, ExtraEnergy and Deutsche Bank are investing here. Birmingham was recently named Destination of the Future at the International FDI Association Awards. Our support for investors, the scale of investment in its infrastructure, talent pool and ambitious economic development were key factors behind that win. Those are some key assets in an area’s quest for “principal business center” status. But Birmingham is not out to unseat London, several times its size, for that title on a national scale. Rather, it plans to take advantage of London’s size by offering investors close proximity to it when the need arises (it’s just 140 miles or 225 km. away) and an economically robust, more affordable base of operations when it does not. HS2 will be central to that strategy. Schuitemaker says leading research universities across the country are considering opening satellite campuses in the area, attracted by the innovative master-plan designed around the HS2 Interchange station in Solihull, a “garden city” and knowledge campus concept combining excellent rail links with a central position in the UK road network, and just 39 minutes by rail from London, 41 minutes from Manchester and 57 minutes from Leeds after the second phase of HS2. Future corporate investors in Birmingham — foreign and domestic — will scarcely recognize the city, if their only perception of it is based on impressions formed years ago, when it was, in fact, a West Midlands industrial hub and didn’t aspire to much beyond that. No longer is that the case. And HS2 is hardly the only new game in town. “We have much more to come,” says Schuitemaker. “In recent years, we have delivered some of the largest regeneration projects in Europe, including the redevelopment of New Street Station, the £200-million ($314-million) expansion of Birmingham Airport and the 120-hectare Black Country Enterprise Zone, home to Jaguar Land Rover engine plant and MOOG. “Yet there is more, with the 14-hectare city center Birmingham Smithfield development, the £200 million redevelopment of the Snow Hill station area in central Birmingham, and Icknield Port Loop, a 22-hectare mixed-use residential led development on the western edge of the city center, all recently launched developments. This has led to recognition of this area as one of the best investment opportunities in Europe,” he points out, citing Birmingham’s 6th place ranking in PwC’s report ranking cities in Europe for property investment attractiveness, outstripping London’s 10th place finish. What kind of business assistance can potential investors expect to find in the Birmingham region? “At Business Birmingham, a team of sector-specific Investment Managers have a comprehensive knowledge of Birmingham and the region as an investment location and are able to provide solutions and programs that support investor’s needs,” says Schuitemaker. “This is critical to our continued success in attracting inward investment. As a single source of intelligence, the Business Birmingham team can harness a wealth of information to support any business case for expansion. These and other offerings are not mere window dressing on the part of the region’s lead economic development office. They are proven tools that get the job done. Business Birmingham has maintained a consistent track record as one of the leading investment promotion agencies in Europe. It was recognized in May as one of the best inward investment bodies in Europe by Site Selection in its Best to Invest 2015 awards — Business Birmingham was named as one of the two top regional Investment Promotion Agencies (IPAs) for Western Europe. This Investment Profile was prepared under the auspices of Business Birmingham. For more information, call 44 (0)121 202-5022, or visit www.businessbirmingham.com. 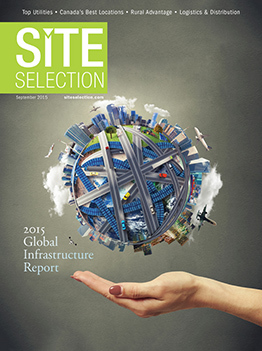 Mark Arend has been editor in chief of Site Selection magazine since 2001. Prior to joining the editorial staff in 1997, he worked for 10 years in New York City at Wall Street Computer Review, ABA Banking Journal and Global Investment Technology. Mark graduated from the University of Hartford (Conn.) in 1985 and lives near Atlanta, Georgia.